Will Smith's take on Aladdin's Genie character isn't leaving a whole lot of people too impressed. To the surprise of House of Mouse fans everywhere, Walt Disney Studios dropped the second teaser trailer for the live-action remake of 1992's Aladdin during the 2019 Grammy Awards. 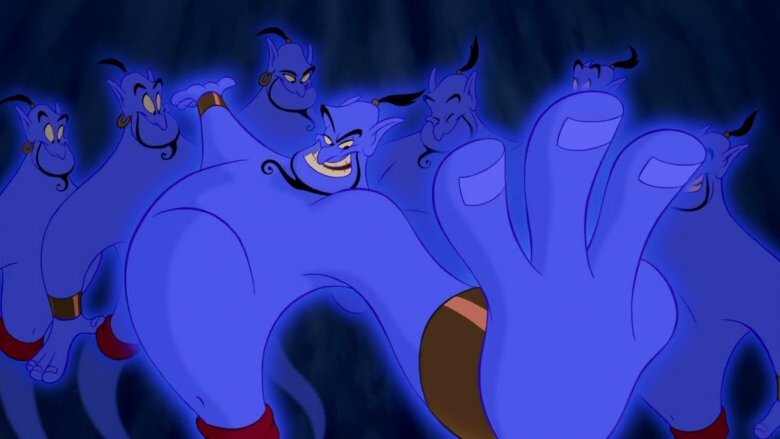 As the minute-long clip passed through Agrabah and into the Cave of Wonders, the world finally got its first glimpse at Smith's Genie in his blue form. And the response wasn't necessarily "shining, shimmering, splendid," as Twitter became abuzz for all the wrong reasons. While the iconic character was originally voiced by the late comedian Robin Williams in the animated film, the big reveal of Smith's CGI spin was not at all what most viewers expected. In all of his blue-skinned, high-ponytailed, pointy black-bearded glory, this short snippet of the actor-musician's performance in Guy Ritchie's Aladdin was immediately and mercilessly mocked by critics and fans alike on social media. So, strap in for a magic carpet ride through the Twittersphere. 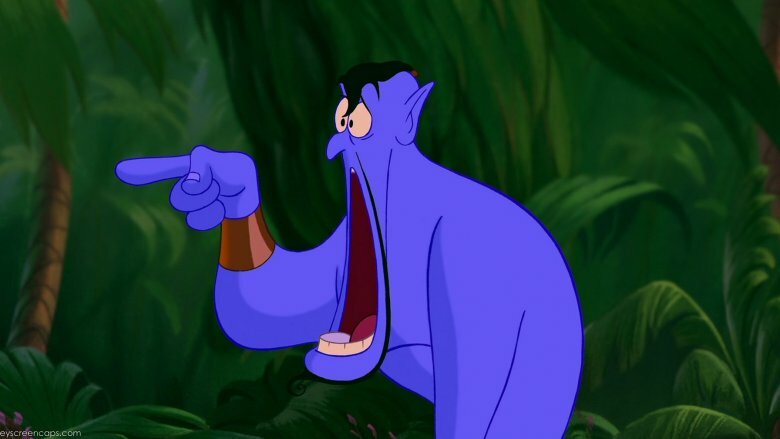 From the horrified to the downright hilarious, below are some of the best reactions to Will Smith's Genie. Robin Williams' raw energy and talent, paired with Disney's fantastical animation, made for one of the most beloved cartoons of all time. However, this cast an undeniable shadow over the 2019 live-action Aladdin remake, which seemingly attempted to steer clear of any obvious comparisons with the original Genie. Noting that the Genie of the early '90s was "clearly otherworldly," Screen Rant suggested, "While it's understandable that Disney would be hesitant to directly copy or go cartoonish … for live-action, making him seem like just some guy painted blue falls flat." That said, Smith's portrayal admittedly bore a striking resemblance to other film and television characters with a similarly blue hue. 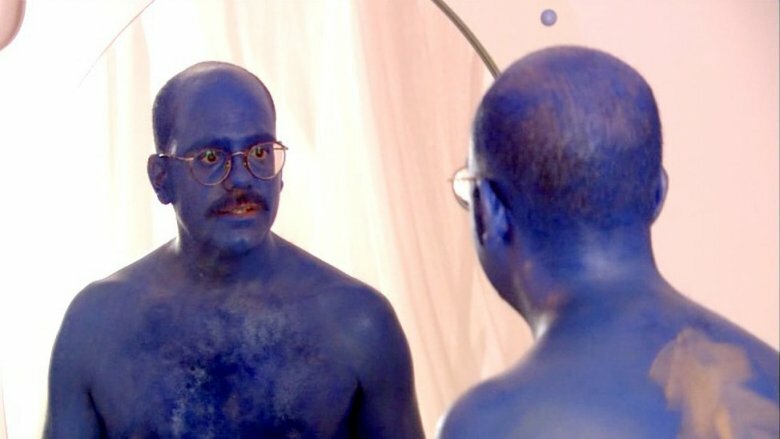 Tens of thousands of people liked a hilarious comparison to Tobias Fünke (played by actor-comedian David Cross) sporting his Blue Man Group makeup on Arrested Development. While Josh Billinson, an editor at the Independent Journal Review, compared Smith's Genie to characters in Avatar, director Caillou Pettis quipped, "This looks like a blue version of Shrek." The seemingly endless list of blue pop culture references on Twitter further included comparisons to the Smurfs to actor Paul Giamatti's character in Big Fat Liar. 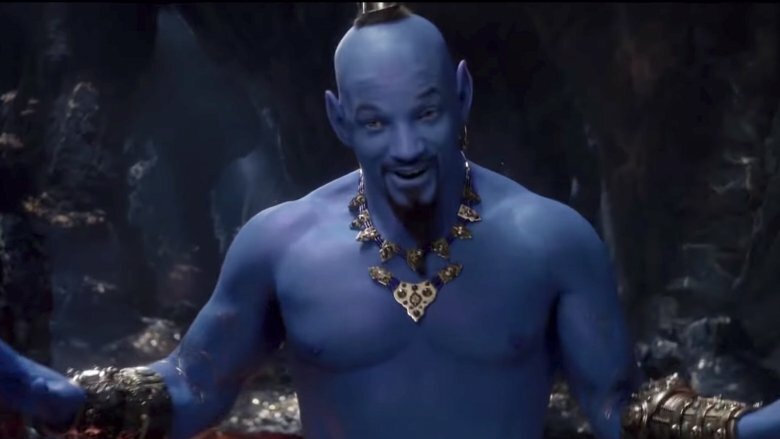 As the topic of much discussion throughout the Twittersphere, the meme-worthy reveal of Will Smith's Genie made it more than susceptible to jokes. With each one more outrageous than the last, a number of tweets came at the expense of another '90s icon: Smith's character on his former long-running TV series, The Fresh Prince of Bel-Air. While riffing on the actor's iconic rap from the sitcom's opening credits sequence, Full Frontal with Samantha Bee writer Mike Drucker tweeted, "In ancient Arabia, bottled and raised, at the cave of wonders spending most of my days chillin' out maxin' relaxin' all cool grantin' wishes to street rats outside the school." Similarly, another person wrote, "Now I'd like to take a minute just sit down champ I'll tell you how I became the genie of this here gold lamp." Things didn't get much better for Smith after other users broke out some pretty hilarious memes, including Media Matters editor-at-large Parker Molloy, who photoshopped the live-action Genie into Maroon 5's ill-fated Super Bowl halftime show. So much ouch all around. 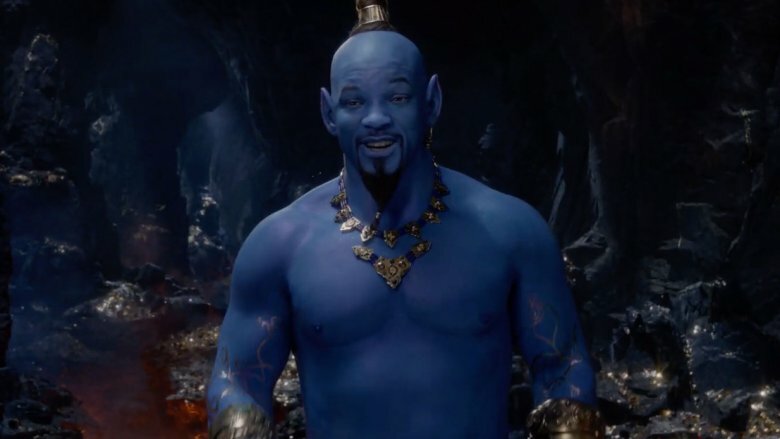 While the jokes kept coming, the reveal of Will Smith's Genie appeared to be the stuff of actual nightmares for countless Twitter users. 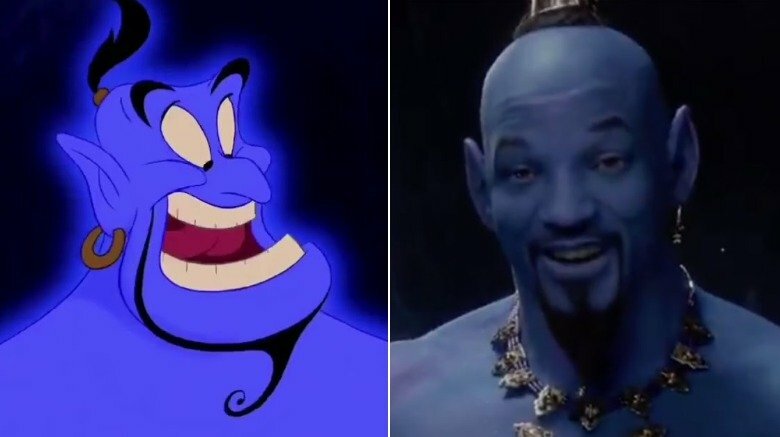 "Will Smith genie is what appears in my room when I have sleep paralysis," YouTuber Jenny Nicholson tweeted, while John Paul Brammer of the Trevor Project wrote, "The bar I'm in had the most VISCERAL reaction of horror to Will Smith in the Aladdin trailer I'm screaming." Meanwhile, Kyle Buchanan of The New York Times devoted an entire Twitter thread to his horrified response, even going so far as to jokingly compare the live-action CGI Genie to the unseen monsters in Netflix's Bird Box. "They premiered this image at night??? We are supposed to sleep after this??? I have never known peace," he wrote, later adding, "Honestly the Will Smith genie feels like a spoiler for BIRD BOX because I finally understand what image would make them so fascinated but also want to kill themselves." All these posts racked up tens of thousands of likes, highlighting just how many other people felt the same way. So, if you lost some sleep over Smith's Genie reveal, you're, at least, not alone. 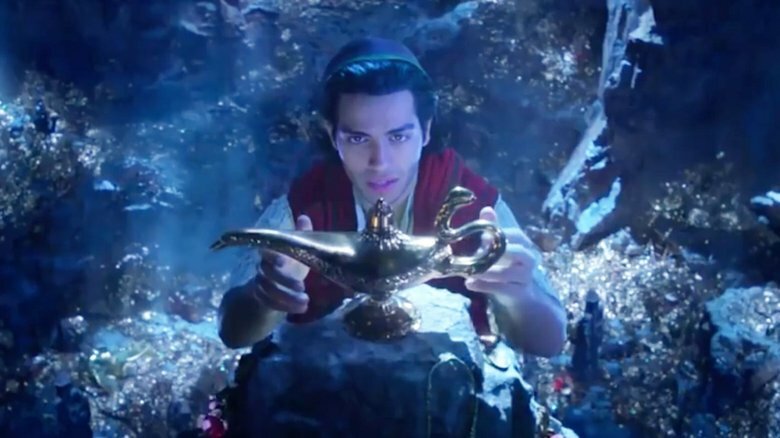 While Disney is known to lead in special effects and animation technologies, most viewers couldn't get past an apparent disconnect between Aladdin's live-action elements and some bad CGI. According to Screen Rant, the House of Mouse's "savvy use of CGI" has historically "carried over into their live-action remakes." However, the publication added, "Smith looks overtly smooth in the way that hastily finished CGI often does, but he also looks just a little too human." Much of Twitter seemed to agree with this assessment. In response to a comparison of Smith's Genie with another Disney creation, Josh Brolin's portrayal of the villainous Thanos in Marvel's Avengers: Infinity War, one person tweeted, "I think this is a actually a good side by side for how to do and NOT to do a CG character with an actor's facial features applied. Thanos looks like he's actually a living character in the movie, Genie looks like he just has Will Smith's face copy-pasted on." For his part, designer-illustrator Mike Tré jokingly wrote, "'Should he look like the genie or like Will Smith?' 'Yes.'" If some of this criticism against Will Smith's Genie sounds familiar, it's because Twitter previously lost its collective mind over the character's first appearance in December 2018. 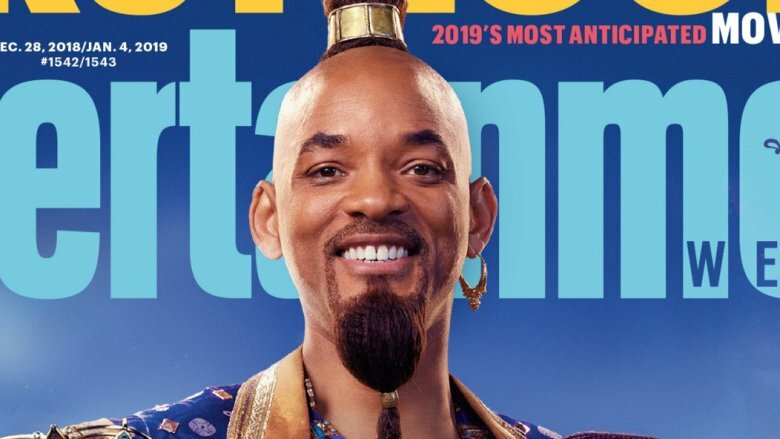 When Entertainment Weekly released the first official photos from Aladdin, Genie essentially looked like Smith dressed up in a genie costume, which led underwhelmed social media users to gripe about the actor's hairdo and wonder why on earth he wasn't blue. Smith quickly responded to these concerns on Instagram, writing, "Yes, I'm gonna be BLUE! This is how the Genie is in Human / Disguise Form. My character will be CGI most of the movie." Unaware of the second round of backlash he was about to endure, he wrote, alongside the second teaser trailer, "I told y'all I was gon' be Blue!! Y'all need to trust me more often!" Perhaps we should've read the movie star's reassurance as a warning. "Remember when the EW images came out for Aladdin and everyone was like oh why isn't Will Smith blue as the genie?!? And now we have THIS," Collider TV critic Allison Keene tweeted. She added, "Be careful what you wish for." Can Big Willie's style live up to the original? No matter how you feel about Will Smith's big Genie reveal, there seems to be one main issue at play here: This larger-than-life role has remained so ingrained within the cultural zeitgeist and childhood nostalgia that it seems impossible to completely separate it from the original. This goes for the Men in Black star himself. "Whenever you're doing things that are iconic, it's always terrifying," Smith told Entertainment Weekly for a December 2018 article. Emphasizing that his take would be "an homage" to Robin Williams' performance, he said, "I think it'll stand out as unique even in the Disney world," adding, "There hasn't been a lot of that hip-hop flavor in Disney history." To be fair, any actor who took on the character once immortalized by Williams would most likely face similar criticism. It just so happens that Smith is the one caught in the crossfires of what seems to be a losing fight. 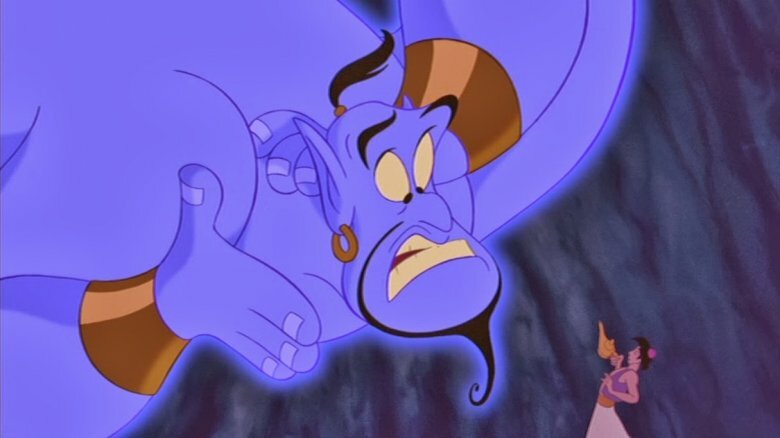 As one Twitter user suggested, there may only be so much live-action movie magic can do compared to the endless possibilities for the Genie in animation, noting, "So no matter what direction you take it in it'll just end up a disappointing downgrade." How would you use your three wishes? Some Disney fans might want to trade in their three wishes "to unsee the Will Smith genie," but there are others who'd wish for Aladdin's live-action treatment to become a hit. "I mean I personally think the new #Aladdin trailer was amazing," the aptly named radio host, Jasmine Sadry, tweeted. "That's just ME personally though." However, her tweet gained thousands of likes, signaling that she's not alone in her opinion. Additionally, in stark contrast to what went down for the most part on Twitter, the comments section of Smith's social media post sharing the February 2019 teaser trailer was quickly flooded with messages of support, according to Evening Standard. Elsewhere on Twitter, some fans simply appeared fed up with the online complaints, and others chose to remain cautiously optimistic about the upcoming Disney flick. Interestingly, a smaller group online felt Smith's Genie was actually the highlight of the trailer. As one Twitter user put it, "HONESTLY I think Will Smith as the Genie is an awesome idea and the rest of the movie is what looks bland/uninspired." No matter how you slice it, however, it seems as though Guy Ritchie's Aladdin just isn't going to please everyone. Amid the era of Disney's live-action remakes, there's no denying that Guy Ritchie's Aladdin has given fans the most cause for concern. Following the on-screen magic of Cinderella, The Jungle Book, and Beauty and the Beast, 2019 will also see the highly anticipated releases of Tim Burton's Dumbo and Jon Favreau's The Lion King. With Aladdin, Disney promised an "ambitious and nontraditional" take on Aladdin, as reported by The Hollywood Reporter in 2016. However, the film has since been shrouded in controversy, with targeted criticism ranging from serious allegations of "brownface" (via BBC News) to, well, disappointment over Will Smith's Genie reveal. Still, within Twitter's general reaction to this new, divisive Genie are those who are totally indifferent. "Hot take: Genie already looked weird in the original Aladdin," one person tweeted. "Because he's a genie." While some Disney fanatics are holding out hope for a whole new live-action adaptation, it looks as though this version of Aladdin may be destined to add more to meme culture than the awards show circuit. Ahead of its release on May 24, 2019, we're doing our best to stay positive.